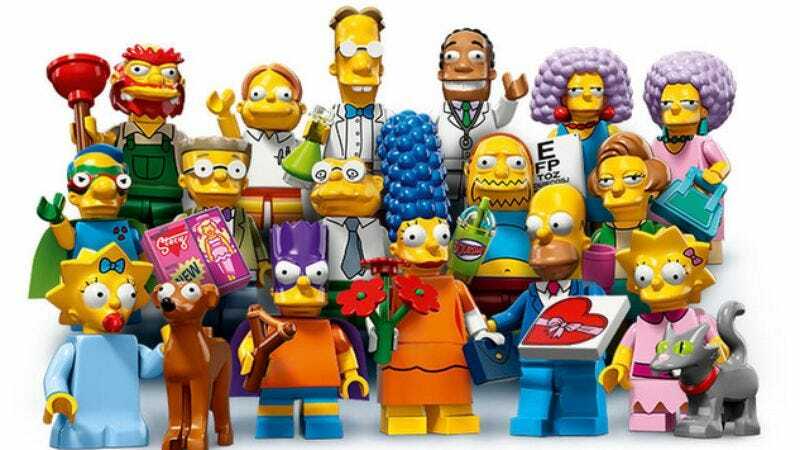 Last year, much to the delight of adult-sized children everywhere, Lego released a set of blind-bagged Simpsons minifigures that were all pretty awesome. Well, except for the fact that the Homer figure was way too common, so you’d buy like eight or nine with some birthday money that your parents sent you and you’d get like four Homers and no Milhouses, even though Milhouse is your favorite and he’s the only one you really wanted, which is so unfair. And yeah, you could go on eBay and just buy the Milhouse toy you want, but the price is jacked up and it’s really not worth more than a couple dollars, so you give up on ever getting it. Anyway, just like the people who make The Simpsons, Lego knows that something that was good once will be just as good if you keep doing it over and over again, so now it’s putting out a second series of Simpsons minifigures. The first generation featured obvious choices like the whole family, Flanders, Ralph, Milhouse (sigh), and Krusty, so the new set is going a little deeper into the show’s well. There will be new versions of Homer, Marge, and Lisa in their fancy clothes, Bart as Bartman, and—jiminy jillikers!—Milhouse as Fallout Boy, but they’ll be joined by totally new characters like Hans Moleman, Comic Book Guy, Groundskeeper Willie, and Professor Frink. There’s even a Smithers, and his special accessory is a replica of the “With New Hat” Malibu Stacy doll. Considering how many of these figures come with, essentially, new hats, that seems a bit ironic. But what good are toys without an expensive playset for them to battle in? Thankfully, Lego also has that covered. Just like the Simpsons’ house that came out alongside the last series of minifigures, there’s going to be a special Kwik-E-Mart set that comes with exclusive versions of Snake and Apu—plus non-exclusive versions of some other characters. The official description of the set even references an appearance from Frostilicus, though he’s probably just a sticker and not a figure of Jasper in a viking hat. Either way, there are new Simpsons Lego sets! What a time to be alive! The minifigures will start appearing in stores in May, and the Kwik-E-Mart set should be available directly from Lego around the same time.